Hack Patch! : Is your ePub reader secure enough? Stories of hacking, patching, and hacking. Is your ePub reader secure enough? Hi, this is my first (and last?) blog post in English. Sorry if there's any grammatical mistake, I'm not too fluent in English. Today, I'll write about ePub file with some of my findings in ePub readers. EPUB is an e-book file format with the extension .epub that can be downloaded and read on devices like smartphones, tablets, computers, or e-readers. An EPUB file is a ZIP archive that contains, in effect, a website—including HTML files, images, CSS style sheets, and other assets. It also contains metadata. EPUB 3 is the latest version. By using HTML5, publications can contain video, audio, and interactivity, just like websites in web browsers. In short, ePub file is a Zip archive that contains a Book built with web technologies such as (X)HTML files, CSS style sheets, images like SVG, and if Reader supports, it could contain JS, PDF, Flash, and so on. EPUB Publication can create security considerations that are different from scripting within a Web browser. But Spec does not talk about what scheme or protocol should Reader use to load ePub contents. So each reader has their own way of implementing this with or without JS. Well, Let's see what could go wrong. While I was testing iBooks, I noticed something. First thing I noticed was that they use file scheme to serve ePub contents. And second thing I noticed was they doesn't allow external website to load inside iframe but they do allow external image to be loaded. So just doing following could leak victim's PC user name. And even worse, Victim's local file could be leaked. See @craig_arendt's blog post for more details. And I also recommend you to read how he hacked online services using ePub file. 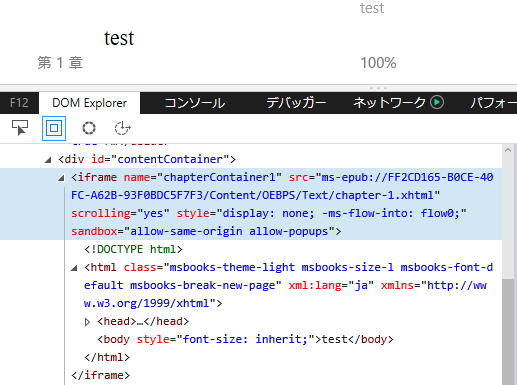 Back to the story, I tried to redirect ePub content to external website using script like location.replace(). But iBooks did not allow redirect. 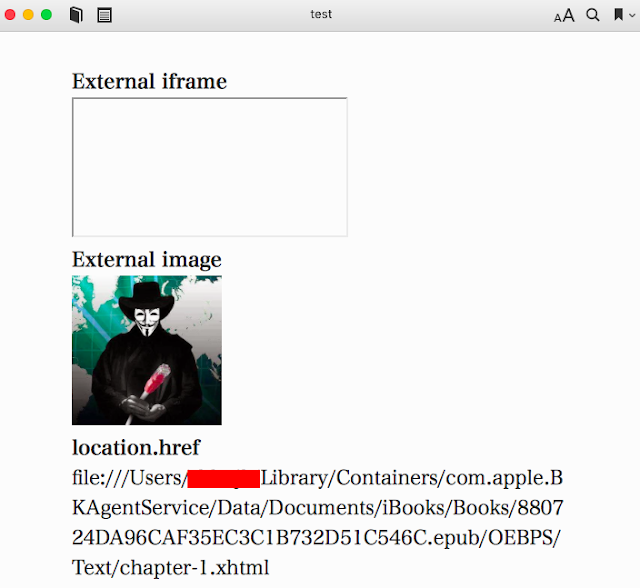 Seeing that iBooks prevents external iframe as well as redirect to external website, I was sure if I could find a way to do so, they would most likely consider it as a vulnerability. So after a bit of kick and punch, I came up with redirect. But instead of opening external website in iBooks, it opened website with default browser😬 Anyways, I've reported this and it's now fixed. ADE is ePub reader developed by Adobe. ADE on Windows uses IE for rendering ePub contents. Wondering how I came to know that ADE uses IE on Windows? See this. 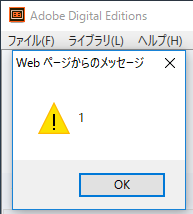 Hehehe😜 Anyways, I won't talk about ADE much because I don't want to say something that Adobe might consider as a vulnerability. So below are the key points. ePub content is served from localhost. It's IE! 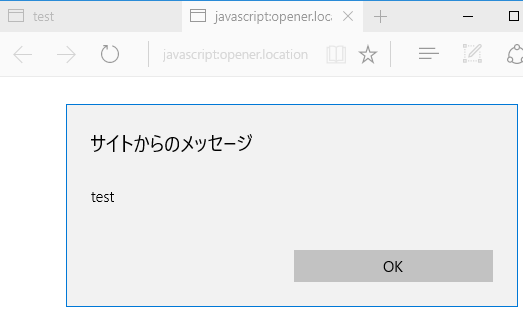 Flash, Adobe Reader, and ActiveXObject are supported. Off course, port is not considered to be part of SOP. Microsoft Edge has built-in ePub Reader. 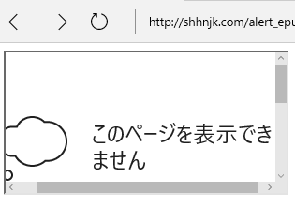 Edge ePub reader is different from previous readers in 2 ways. You can read web hosted ePub files without download. Now let's see their implementation! When you navigate to ePub file, it seems like it's just loaded as it is. 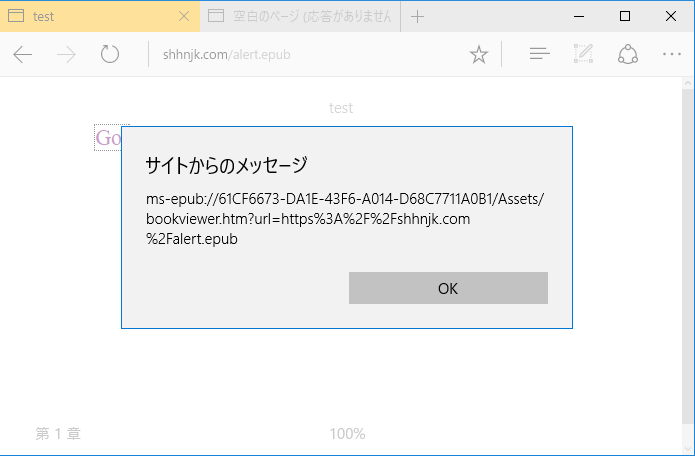 But in the backend, it is redirected to ms-epub protocol like below. 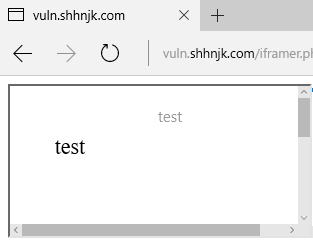 "location.host" part of ms-epub URL is random string and it changes every time you load ePub file. Yes!!! Even though "location.host" part of ms-epub was random string, we could reuse previously used string to load ePub file again! So we will load user content which contains script and game over right? Okay, this worked as expected! Further testing on url parameter, I noticed that we could actually load any cross origin ePub file using url parameter. And even if we change url parameter, origin of ePub reader remains same, so we have full access to content of cross origin ePub files!! So we could abuse ePub reader JS execution to spoof address bar and also to steel information from cross origin ePub file. 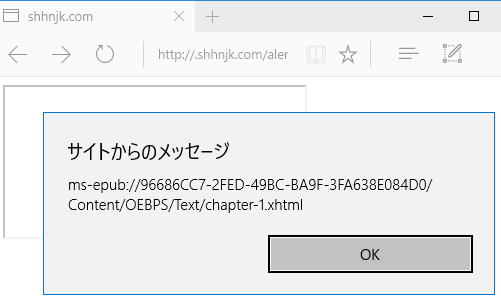 The vulnerable version of ePub reader was only available to Windows Insiders for 3 months and after I reported this to MSRC, they've fundamentally fixed the ePub reader issues. So ePub reader release with Creators Update has some mitigations. Enjoyed, thank you. Very clear, almost scientific. Don't worry about grammar and spelling. Getting the idea across is key. Enjoy the bounty.